Fairborn starting pitcher Will Coleman delivers a pitch to start the second game of Friday’s March 30 doubleheader with National Trail. The games were played at Wright State University’s Nischwitz Stadium. Nate Fasnacht of Fairborn dives safely back to first base, March 30 in a high school baseball game against National Trail. Fairborn’s Saysh Martinez hits a grounder to the National Trail shortstop in the second inning of Friday’s second game of a doubleheader March 30 at Nischwitz Stadium on the Wright State University campus in Fairborn. 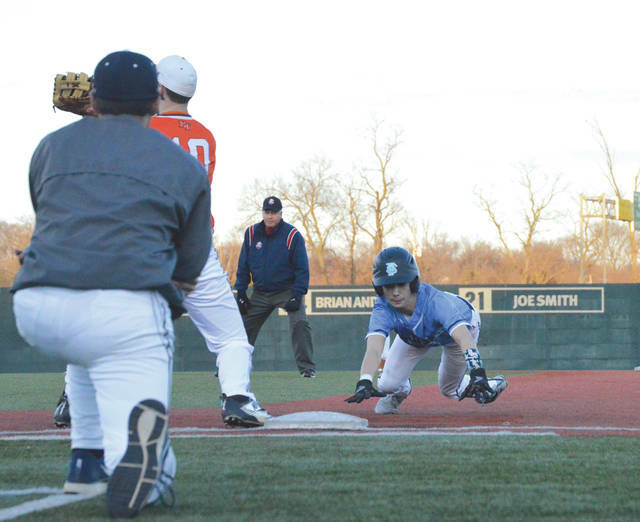 FAIRBORN — If the Skyhawks’ team resiliency has anything to do with it, Fairborn and visiting National Trail might still be playing the second game of their high school baseball doubleheader, March 30 at Wright State University’s Nischwitz Stadium. After run ruling the visiting Blazers, 15-5, in the first game, the Skyhawks found themselves down 6-2 after five inning of play in Game 2. 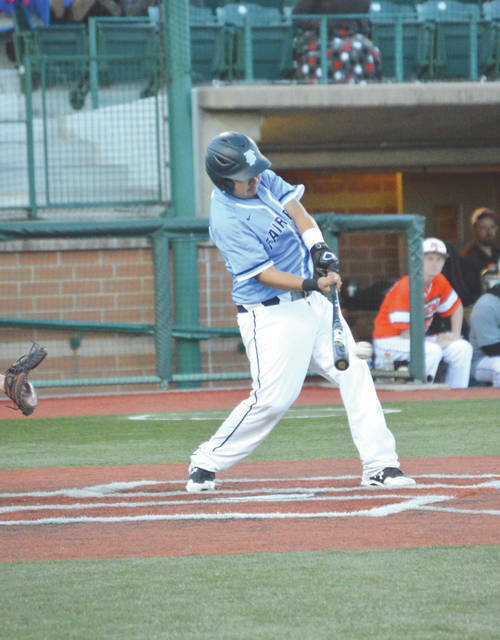 Fairborn mounted a rally in the bottom of the sixth, scoring three runs on just one hit. Cohen Bowman, pinch hitting for Jacob Moore, drew a lead-off walk, then moved to third on a wild pitch. 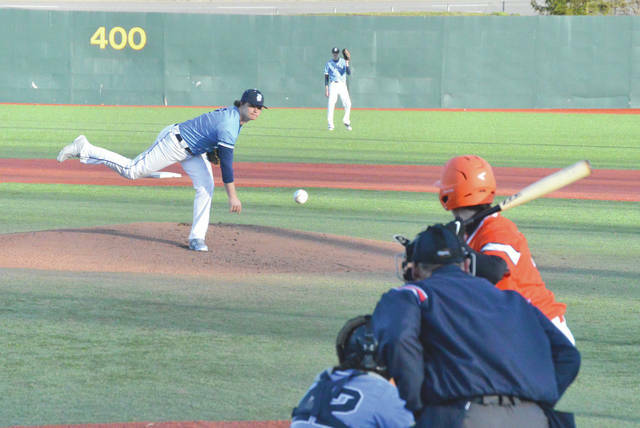 Jarod Bodekor, batting for Saysh Martinez, hustled down the first base line to leg out on infield single to deep second to move Bowman to third. Nate Fasnacht then drew a walk to load the bases. Everybody advanced on a passed ball, with Bowman scoring to make it 6-3. With one out, lead-off batter Will Coleman was intentionally walked for the third time in the game. He advanced to second on a wild pitch and Bodekor scored from third to pull the Skyhawks within two runs at 6-4. Andrew Trickett came in to pinch-hit for Mark Peterangelo and grounded out to second to score Fasnacht at third to make the score 6-5. National Trail failed to score in its half of the seventh, but Fairborn had better fortunes. First, Kahlil Lettice bashed a double into right center field to lead off the Skyhawks’ bottom of the seventh inning. FAirborn coach Josh Patrick sent in Andrew Yeary to pinch run for Lettice. After Jacob Moore was put back into the lineup in Bowman’s place and struckout, Fairborn’s Bodekor and Fasnacht were both hit by pitches in successive trips to the plate, loading the bases. Batting ninth, Jacob Benge then drew a bases loaded walk to tie the game up at six runs apiece. Due to deadline constraints, we had to leave the contest at that point. Unofficially, Fairborn had collected four hits with the Martinez’ double being the only extra-base knock of the night. We’ll have a game recap in our next newspaper issue, which comes out on Tuesday, April 3. That is, if the two teams are finished by then!